These three plants, only two of which are botanically related, have been combined into one document for their almost equal culinary merits. The term cress will henceforth be used for all three plants described in this document. 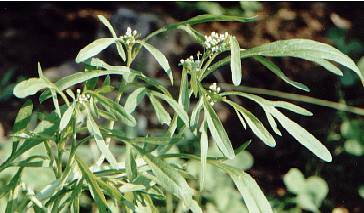 Despite its name, paracress (para cress) is a herb wholly apart, and not related botanically nor culinarily to any of the cresses. Fresh leaves. Unripe nasturtium fruits can be pickled and used as a substitute for capers. Water and garden cress belong to Brassicaceae (cabbage family); nasturtium belongs to Tropaeo­laceae, a botanically not related family of its own. Cress and its relatives display a spicy aroma and a refreshing, peppery-pungent taste lasting only a few seconds. Similar to many other members of the cabbage family (black and white mustard, horseradish, wasabi, rocket), all cresses owe their aroma to isothiocyanates. The isothiocyanates are formed from inactive precursors called glucosinolates as a reaction to injuries. 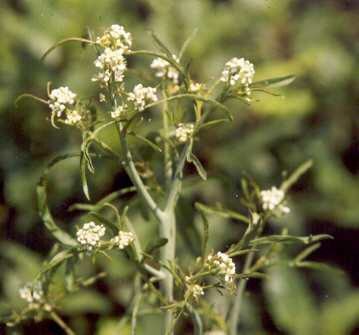 Water and gar­den cress contain gluco­nasturtiin, which yields the 2-phenyl­ethyl iso­thiocyanate (C6H5–CH2–CH2–NCS). 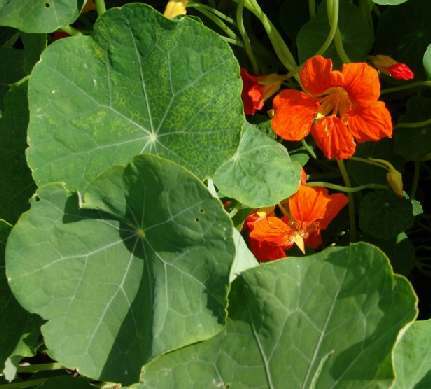 In contrast, the pungency of nasturtium leaves comes from benzyl iso­thiocynate, (C6H5–CH2–NCS), which is created from gluco­tropaeolin (benzyl glucos­inolate); yet in nasturtium seeds, another glucosinolate was found (gluco­putranjivin), which yields isopropyl isothiocyanate on enzymatic hydrolysis. 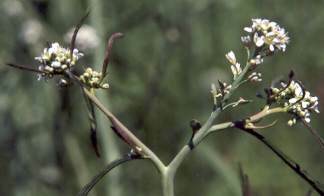 Benzyl isothiocyanate is closely related to the pungent principle of white mustard, but much more volatile and, thus, less persistent. Since all these isothiocyantes are volatile and much susceptible to heat and moisture, cress aroma is most delicate; thus, cress leaves are always used fresh, never dried, and should not be boiled, baked or otherwise heated. 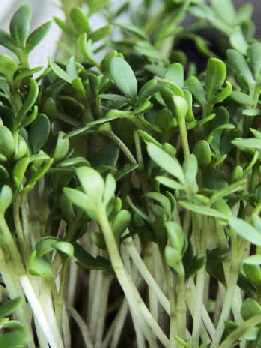 Garden cress probably stems from West­ern or Cen­tral Asia, where it is still found in the wild state. It is easy to culti­vate and tol­er­ates nearly every climate. 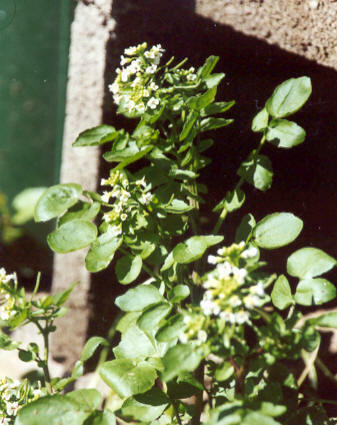 The cosmo­politan water cress is similar in taste and can, thus, be sub­stituted by ordinary garden cress; its aroma, how­ever, is some­times de­scribed su­pe­rior to other cress species. Although water cress was one of the herbs which Charle­magne or­dered to be grown in Im­perial gardens (see lovage), it is not grown com­mer­cial­ly in our days. It might be available on markets, either from small-scale back­yard culti­vation of from collections in the wild. 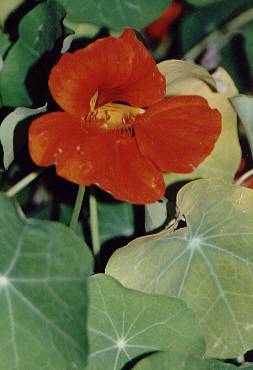 Nasturtium stems from Southern America, probably Perú, and was introduced to Europe by Spanish conquistadores. 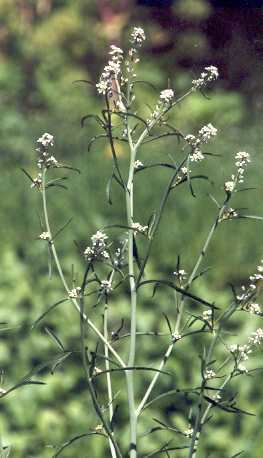 It is a common ornamental, but less used for cooking. The Greeks knew a plant with pungent leaves which was of Persian origin; also the Greek name of that plant, kardamon [κάρδαμον], was a loan from the con­tempo­rary lan­guage of Persia. Though the exact botan­ical re­lations are un­clear, that word has sur­vived, in the form of kar­damo [κάρ­δαμο], as the New Greek name of garden cress (yet car­damom has the same name!). Cf. 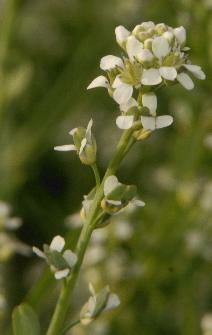 also the botan­ical name of the related genus Car­damine (bitter cress), which con­tains the Cuckoo Flower or Lady’s Smock, Car­damine pratense. 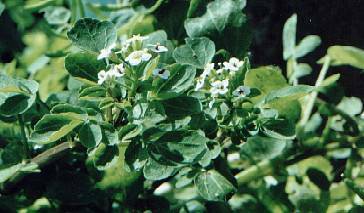 English cress (from Old English cærse) is not related to that. Instead, it is usually put into relation with the other­wise iso­lated Latvian griezīgs sharp ; another theory derives it from the Proto-Indo–European root GRAS devour whence also Old Norse kras delicacy , Sanskrit grasati [ग्रसति] he eats , Greek gran [γρᾶν] gnaw . See also the etymo­logy of grass (lemon grass). Comparatively few lan­gu­ages take the ob­vious choice to name cress as pepper-grass or pepper-herb , e. g., Yid­dish fefer­gros [פֿעפֿערגראָס], Hun­garian bors­fű and Japanese koshō-sō [胡椒草, こしょうそう, コショウソウ]. Only the third one is really a standard name, the former two are more regional variants. Possibly, also Georgian c’ic’mat’i [წიწმატი] has a similar back­ground (c’ic’ak’a [წიწაკა] chile ). Note that some languages have a name of pepper-herb type that refers to savory; in Hun­garian, borsfű may actu­ally de­note both plants. The classical Latin name nas­turtium (used by the Romans for several cress-like plants, mostly garden cress) probably derives from nasi-tortium nose pain (from nasus nose and the verb torquere torment ) and refers to the sharp, pungent aroma. 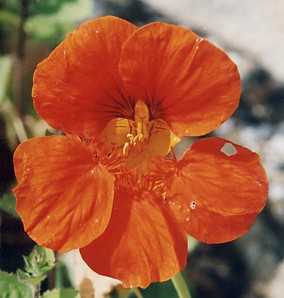 The term Nasturtium has become the botani­cal genus name for water cress; yet, in English, it is common­ly used for Tropaeolum, a plant of new-world origin that was ob­vious­ly un­known to the Ro­mans. Clearly, this is a source of confusion. Water cress bears, in most lan­guages, an attribute meaning water (Indo­nesian air, Finnish vesi, German Wasser, Italian acqua, Russian voda [вода], Greek nero [νερό]) or well; fountain (German Brunnen, French fontaine), referring to its frequent growth in silent water. About the etymology of water, see water pepper. 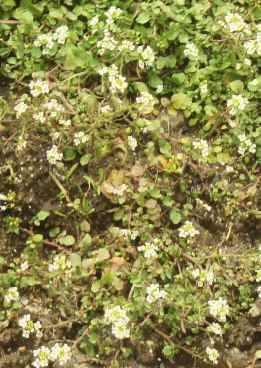 Some names of nas­turtium relate to its origin from Latin America, e. g., French cresson d’Inde or Swedish indian­krasse (Ameri­can) In­dian cress . These names, however, should not be confused with designations like Brazil cress which refer to a culinarily distinct plant commonly known as paracress. Other names of nasturtium refer to its import by members of Catholic Christian orders, e. g., Turkish lâtin çiçeği Latin flower Bulgarian latinka [латин­ка] and Kurdish ladan [لادةن]; in these names, Latin hints not at the language but alludes to Rome as the center of the Roman Catholic Church. Names like German Kapuziner­kresse, French capucine, Dutch capuciener­kers, Italian cappuccina, Arabic nabat al-kabbusin [نبات الكبوسين] and Russian kaputsin-kress [капуцин-кресс] are motivated by the same association with Catholic monks, and in addition by the similar shapes of nasturtium flowers and the cowl of Capuchin monks. The name of the Capuchin order derive from Italian cappuccio hood; especially a monk’s cowl , related to English cap. The same motive is found in Hebrew kova ha-nazir [כובע הנזיר] monk's cap and gargir ha-nazir גרגיר הנזיר monk cresss . The botanical genus name of nas­turtium, Trop­aeolum, was coined from Greek tropaion [τρόπαιον or τροπαῖον] trophy , by which the an­cients meant parts of the de­feated enemy’s armour pub­lic­ly dis­played as a sign of vic­tory. The re­ference is both to the shield-formed leaves and the flowers which resemble a helmet if viewed from the side. Tropaion itself derives from trope [τροπή] change, turning (also the turning point when a fight is lost) and is thus related to many English words like tropic (the parallels of latitude where the sun turns from the zenith) or catastrophe (the moment when fate turns to evil). The Proto-Indo–European root behind that word is TREP turn . English speakers, beware: Since Nasturtium is the botanical name of water cress and not of the plant commonly called nasturtium, there is much room for confusion. 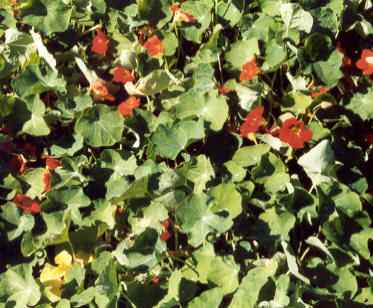 Especially, gluconasturtiin does not occur in nasturtium! 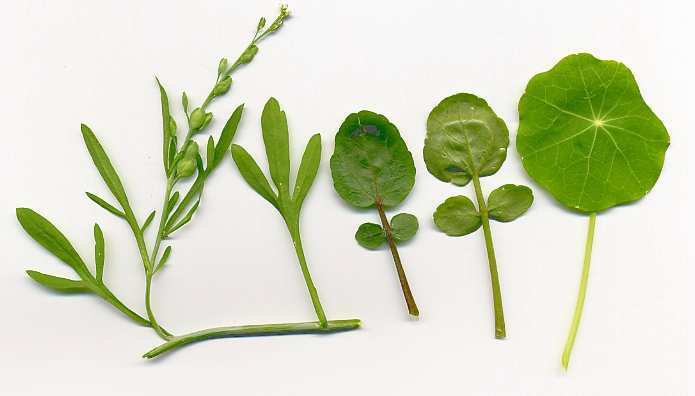 All 3 cress species (which are approxi­mately inter­changeable in the kitchen) are popular in Europe and North­ern America and used for bread spreads (espe­cially such based on cot­tage cheese) and salads; simple bread with butter and fresh cress leaves tastes deli­cious. Less fre­quently, chopped cress leaves are topped on warm dishes, like veg­etable soups or scrambled eggs. Whenever used, cress turns an every­day dish into an ex­quisite delicacy. In Europe, cress leaves are not com­mon­ly com­bined with other fresh herbs; yet they are com­patible with the fines herbes of French cuisine (see chives) and may be used to­gether with each of them. 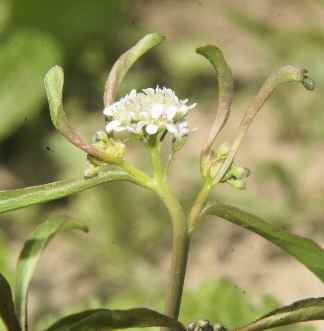 Leaves or even more flowers of nas­turtium are com­mon­ly used to flavour herbal vinegar (see dill); cress is also very good for herb sauces (see borage). In West and Central Asia, there are local culinary herbs with cress-like flavour; most cook­books silently substi­tute cress in these recipes, which is the more justi­fied as garden cress actually stems from that region. 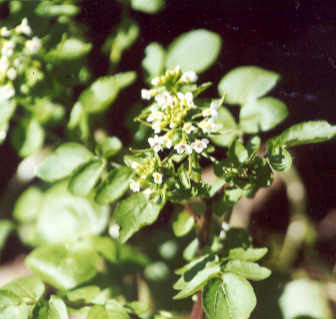 Cress is used from North West­ern Asia (Georgia, Azer­baijan) to Central Asia (Iran); it even appears in Kazakhi cooking, as one of the few herbs supported by the climate in Kazakh­stan. I have not seen it any­where further East, except on the herb-rich markets of Manipur (see also chameleon plant) and in Nepali home gardens. The obvious dis­advan­tage of all cresses is that the leaves cannot be dried and are only rarely traded. 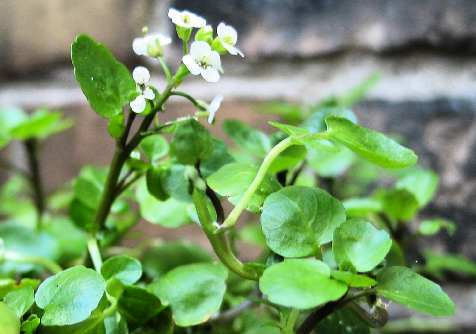 Growing at home may be quite a chal­lenge for water cress, as it needs a wet habitat; but both garden cress and nasturtium grow well in every garden with minimal effort. Garden cress is surprisingly unpretending and grows extremely quickly; about one week after sowing, the young seedlings are ripe for harvest, although older plants are edible as well. To have fresh garden cress at any time, use three pots and sow in three-day intervals. Nasturtium, on the other hand, needs a little bit more care than garden cress, but then may grow ex­uberant­ly for one season (in cold climate). Its yellow, orange or red flowers are very decora­tive and have addi­tional use: The flowers make an inter­esting decora­tion with a sligh rose-like scent and a mild pungency; young fruits have a strong flavour almost comparable to horse­radish. Both buds and young fruits may be pickled in vinegar (either hot or cold) and develop an interesting taste that makes them a good substitute for capers. Nevertheless, culinary use of leaves, buds or fruits is quite uncommon. 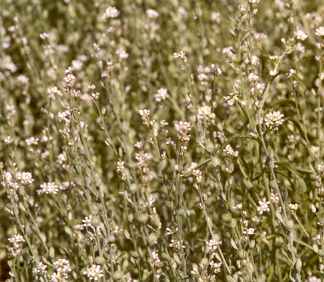 A Medi­terranean herb, rocket, displays a similar pungency like cress, but has also a distinct, intense flavour. Rocket can often be used as a spicier alternative to cress.